Garrincha was the inspiration for a Brazil side that flew across the Andes and mounted a successful defence of the Jules Rimet Cup in Chile in 1962. Amarildo, Zito and Vava scored the goals that defeated Czechoslovakia in the Final but there was no question who was the real hero of the Seleção's second FIFA World Cup™ triumph. "The most extraordinary right winger football has known" was French newspaper L'Equipe's description of Garrincha, the so-called 'Little bird' who was, at 25, at the very height of his powers. 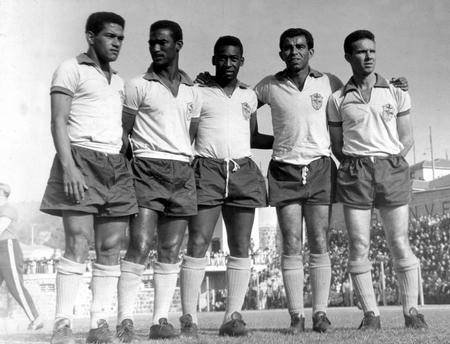 Brazil's squad featured nine of their 1958 world champions, albeit under the guidance of a new coach in Aymore Moreira. Brother of Zeze, the man in charge in Switzerland in 1954, he took the reins after Vincente Feola stood down because of ill health. Moreira adopted a 4-3-3 formation and the holders opened with a 2-0 win over Mexico, Mario Zagallo and Pele scoring. It proved Pele's final contribution of note as early in Brazil's second game against Czechoslovakia, the 21-year-old pulled up with an injury to his left thigh. His tournament was over but with the magical dribbling skills and matchwinning prowess of Garrincha, and prominent contributions from Zagallo – a future world champion as a coach in 1970 – and Pele's replacement Amarildo, the Brazilians were able to shrug aside the absence of their injured No10. Chile had won the right to host the FIFA World Cup ahead of neighbours Argentina. 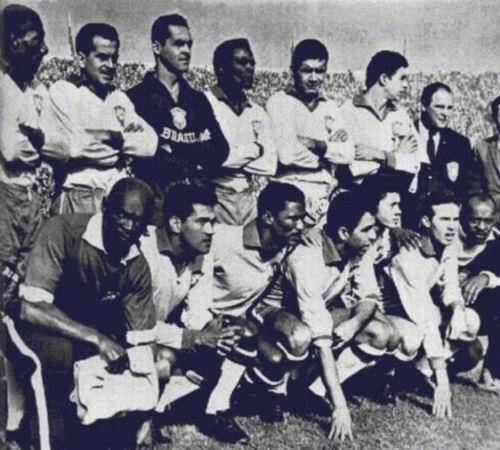 Despite the host country having suffered the century's biggest earthquake two years earlier, on 30 May 1962 the finals opened with matches at the four venues of Santiago, Vina Del Mar, Rancagua and Arica. Santiago's new Estadio Nacional stood against the beautiful backcloth of the snow-capped Andes yet it staged one of the ugliest matches in the tournament's history in the first round, when Chile faced Italy. There were red cards for Italy's Giorgio Ferrini and Mario David and red mist all around. 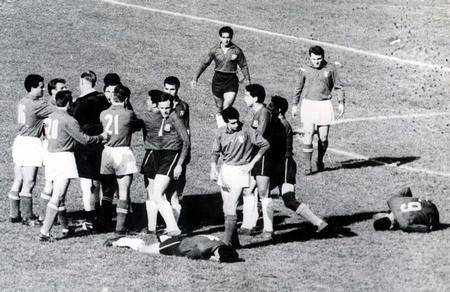 David's dismissal followed a neck-high kick aimed at Leonel Sanchez in retaliation for a punch by the Chilean, son of a boxer, who had earlier broken the nose of Umberto Maschio, one of Italy's naturalised South Americans. "The most stupid, appalling, disgusting and disgraceful exhibition of football" was the BBC's verdict. For the record, Chile won 2-0. Spain, like Italy, were early casualties. With Helenio Herrera, soon to conquer Europe with Inter Milan, at the helm and a host of stars from Real Madrid, including Ferenc Puskas – now appearing in Spanish rather than Hungarian red – they entered their final pool fixture against Brazil needing a positive result to reach the last eight. It proved arguably the game of the round (albeit with fewer thrills than Colombia's fightback from three down to hold the Soviet Union 4-4). Puskas set up Adelardo Rodriguez to score and with Brazil bemused by Herrera's catenaccio tactics, Spanish hopes grew. Yet two late goals by Amarildo – the second with four minutes remaining – brought defeat and raised questions over why Alfredo Di Stefano, struggling with injury yet also seemingly at odds with his coach, had not featured once. This was the first FIFA World Cup without play-offs to decide who should progress when a section's second and third-placed teams finished tied on points. Hence England advanced ahead of Argentina on goal average. They had defeated the Albiceleste 3-1 but lost by the same score to Brazil in the quarter-finals. England forward Jimmy Greaves halted a stray dog's incursion on to the field but there was no stopping Garrincha: after heading in the first, his half-saved free-kick set up Vava's second, before he settled matters with a swerving strike from distance. Brazil then defeated the hosts 4-2 in the semi-finals, Garrincha and Vava each netting twice to subdue opponents roared on by 80,000 fans. Chile, who would finish third, had earlier overcome the Soviets in one of several quarter-final surprises. Repeated interventions from goalkeeper Vilem Schroif and his goal frame helped Czechoslovakia beat Hungary, while it was third time lucky for Yugoslavia as they defeated the West Germany team who had ousted them at this stage in 1954 and 1958. The disappointed Germans' response? The introduction the next year of the professional Bundesliga. Yugoslavia's luck ran out against semi-final opponents Czechoslovakia, Schroif starring again before two late Adolf Scherer strikes secured a 3-1 win. Rudolf Vytlacil's side had held Brazil to a first-round stalemate but were now clear underdogs, their prospects hardly helped by Garrincha's availability to play despite his sending-off in the semi-final. Yet, reappearing in the Final after a 24-year absence, they took a 15th-minute lead through Josef Masopust, their inspirational midfielder who would end the year with the Ballon D'Or. He timed perfectly his forward run to collect a Scherer pass and score. The lead was short-lived, however, Schroif beaten by Amarildo at his near post. Amarildo was not finished there, for with the scores level approaching the 70th minute, his turn and cross set up Zito to head Brazil in front. A Schroif spill then allowed Vava to seal the victory and join Garrincha and four others – Chile's Sanchez, Hungary's Florian Albert, Soviet Union's Valentin Ivanov and Yugoslavia's Drazen Jerkovic – at the top of the scoring table. With four goals each, all had a claim to the Golden Shoe. But the big prize was indisputably Brazil's again.